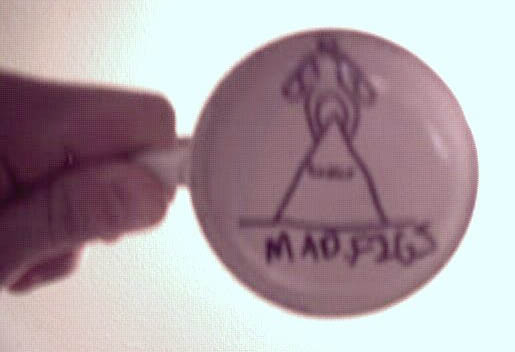 The passing of the MAD FIGS mug is one of the oldest traditions of the MAD FIGS. 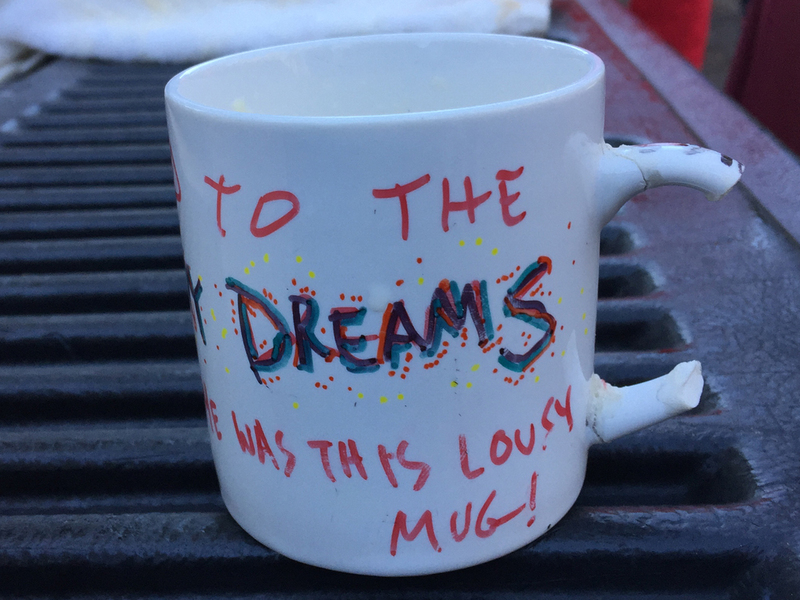 The mug originated in Santa Cruz at the Beach Boardwalk. While visiting there, Justin failed to get anything for his parents. 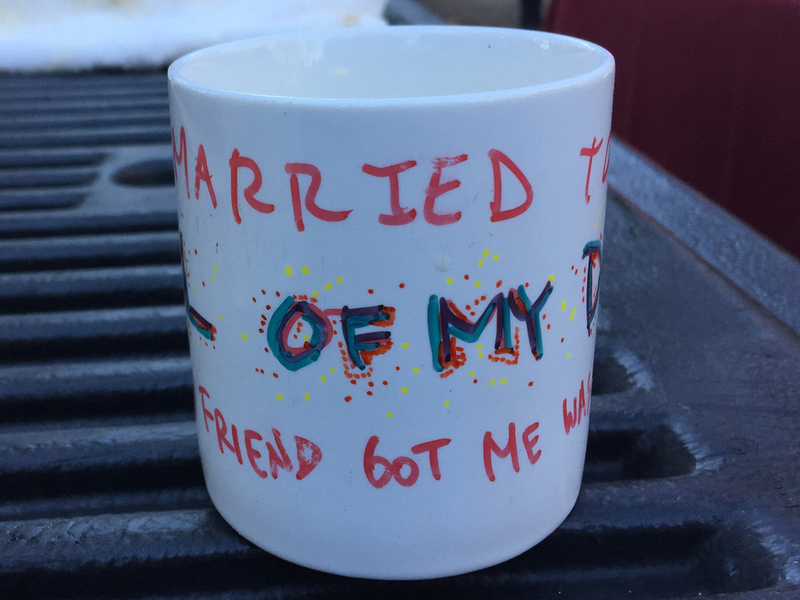 Instead, he won a free mug, on which he wrote "My friend went to Santa Cruz and all I got was this lousy mug." His parents were delighted with the gift, and were distressed when the writing washed away after several uses. The passing of the mug began on Paul's birthday, when Justin gave it to him as a gift, decorated with various MAD FIGS ensignia. Paul kept the mug for a while, but then redecorated it and gave it to the Animal. The Animal gave it to Scott Dogg, who gave it to Jacob, who gave it back to Justin. The cycle repeated itself annually until 1997, when Scott Dogg was forced to mail the mug to Jacob, who was away at college. 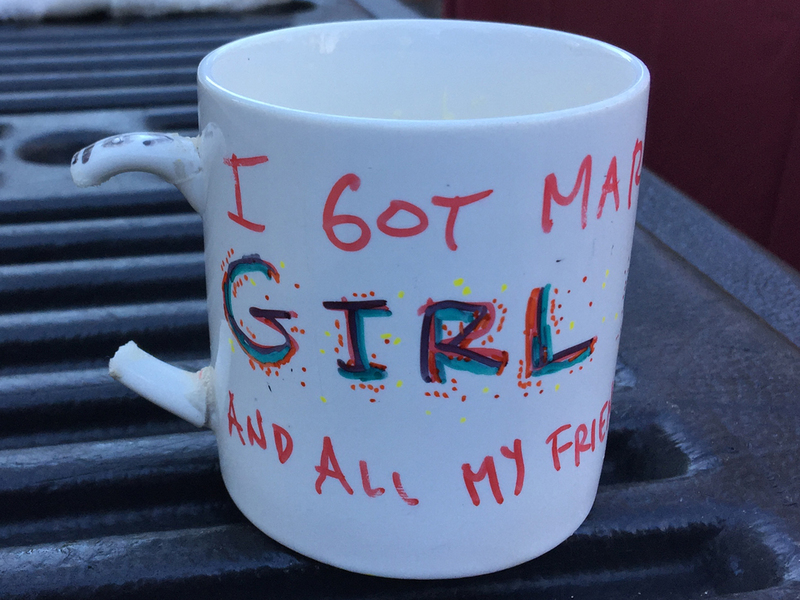 In what is being hailed as "the most important archeological find of the millennium," scientists this week unearthed what appears to be the official MAD FIGS birthday mug in a remote village in southeastern Illinois. The mug had been missing for countless years, and was thought by most experts to have been destroyed. "We're all very excited about this find," said Sasha Vogel, the archeologist in charge of the dig. "It's not every day you uncover one of the prized possessions of the MAD FIGS." A recent study placed the mug's value at close to $935 billion. "It's a stroke of luck that we were able to recognize the mug when we came across it," Sasha explained. "Because its appearance is known to change almost at random, we never know what it's going to look like. But we are now 100% certain that the find is authentic." Sources indicate that the mug has been returned to its rightful owner, local resident Scott Dogg. While the exact methods for determining ownership are understood by very few, it seems that the next person in line to receive the artifact is Jacob Eikns, another of the MAD FIGS. Scientists all over the world are anxious to study the mug's mysterious properties, and the first project scheduled involves a new high-tech photography process that will capture images of the mug in its entirety. The images mentioned can be found below. The mug is currently back in circulation, received by Matt Henschel for his 30th birthday. After a brief break, it was next passed to the Animal as a wedding and late birthday present.